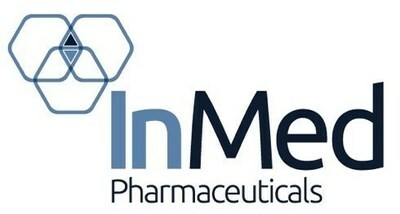 VANCOUVER, Dec. 4, 2018 /PRNewswire/ - InMed Pharmaceuticals Inc. ("InMed" or the "Company") (TSX:IN; OTCQX:IMLFF), a cannabinoid-based biopharmaceutical company that leverages its proprietary platform technologies to develop novel therapeutics for the treatment of diseases with high unmet medical needs, is pleased to announce that it has signed a contribution agreement with the National Research Council Canada Industrial Research Assistance Program ("NRC IRAP") to receive funding of up to C$500,000 to support InMed's ongoing R&D efforts in cannabinoid biosynthesis. NRC IRAP provides advisory services and funding to Canadian businesses to promote accelerated growth and technology innovation. In particular, funding from NRC IRAP will be applied to improve production of the different components of the terpenoid biosynthetic pathway, a pre-cursor of cannabinoid production, as well as research and development supporting up-stream and down-stream scale-up activities conducted by InMed's contract development and manufacture organizations. The funding will be received over the next 18 months. The Company also continues its efforts to further diversify the number of cannabinoids produced using its technology platform. "Manufacturing of pharmaceutical grade cannabinoids remains a major challenge to the industry," commented Dr. Eric C. Hsu, Ph.D., InMed's Vice President, Pre-Clinical Research & Development. Dr. Hsu continued, "We are extremely honored to receive this non-dilutive investment from NRC IRAP. This funding will support our on-going efforts to establish a leadership position in the field of cannabinoid biosynthesis." This news release contains "forward-looking information" and "forward-looking statements" (collectively, "forward-looking information") within the meaning of applicable securities laws. Forward-looking information is based on management's current expectations and beliefs and is subject to a number of risks and uncertainties that could cause actual results to differ materially from those described in the forward-looking statements. Forward-looking information in this news release includes statements about: developing novel therapeutics for the treatment of diseases with high unmet medical needs; receiving the NRC IRAP funding over the next 18 months; applying the NRC IRAP funding to improve production of the different components of the terpenoid biosynthetic pathway as well as up-stream and down-stream scale-up activities conducted by InMed's CDMOs; further diversifying the number of cannabinoids produced using InMed's technology platform; leading the field of cannabinoid biosynthesis; and the expected fundamental value drivers of the Company. With respect to the forward-looking information contained in this news release, InMed has made numerous assumptions regarding, among other things: the availability and timing of NRC IRAP's funding; continued and timely positive preclinical and clinical efficacy data; the speed of regulatory approvals; demand for InMed's products; and continued economic and market stability. While InMed considers these assumptions to be reasonable, these assumptions are inherently subject to significant business, economic, competitive, market and social uncertainties and contingencies. Additionally, there are known and unknown risk factors which could cause InMed's actual results, performance or achievements to be materially different from any future results, performance or achievements expressed or implied by the forward-looking information contained herein. Known risk factors include, among others: the NRC IRAP funding may not be received over the anticipated schedule, if at all; the NRC IRAP funding may not be applied as currently anticipated; InMed may not be able to improve production of the different components of the terpenoid biosynthetic pathway or the up-stream and down-stream scale-up activities conducted by InMed's CDMOs; InMed may not be able to diversify the number of cannabinoids produced using its technology platform; InMed may not establish a leadership position in the field of cannabinoid biosynthesis; preclinical and clinical testing may not produce the desired results on a timely basis, or at all; regulatory applications may not be approved on a timely basis, or at all; suitable partners may not be located; economic or market conditions may worsen; and InMed's proprietary bioinformatics platform, biosynthesis manufacturing process and drug development programs may not deliver the expected level of results nor become the fundamental value drivers of the Company. A more complete discussion of the risks and uncertainties facing InMed is disclosed in InMed's most recent Annual Information Form and other continuous disclosure filed with Canadian securities regulatory authorities on SEDAR at www.sedar.com.